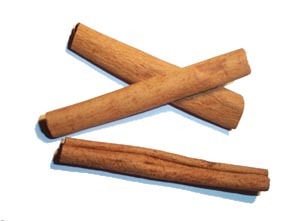 Cinnamon is a spice obtained from the inner bark of a small evergreen tree native to Sri Lanka. Cinnamon is principally employed in cookery as a condiment and flavouring material, being largely used in the preparation of some kinds of chocolate and liqueurs. The best cinnamon is from Sri Lanka, but the tree is also grown at Tellicherry, in Java, the West Indies, Brazil, and Egypt. Sri Lanka cinnamon of fine quality is a very thin smooth bark, with a light-yellowish brown colour, a highly fragrant odour, and a peculiarly sweet, warm and pleasing aromatic taste. Its flavour is due to an aromatic oil which it contains to the extent of from 0.5 to 1%. This essential oil, as an article of commerce, is prepared by roughly pounding the bark, macerating it in sea-water, and then quickly distilling the whole. It is of a golden-yellow colour, with the peculiar odour of cinnamon and a very hot aromatic taste. This page was last edited on 5 January 2012, at 06:04.